Dennis Hollingsworth: Where do we go from here? 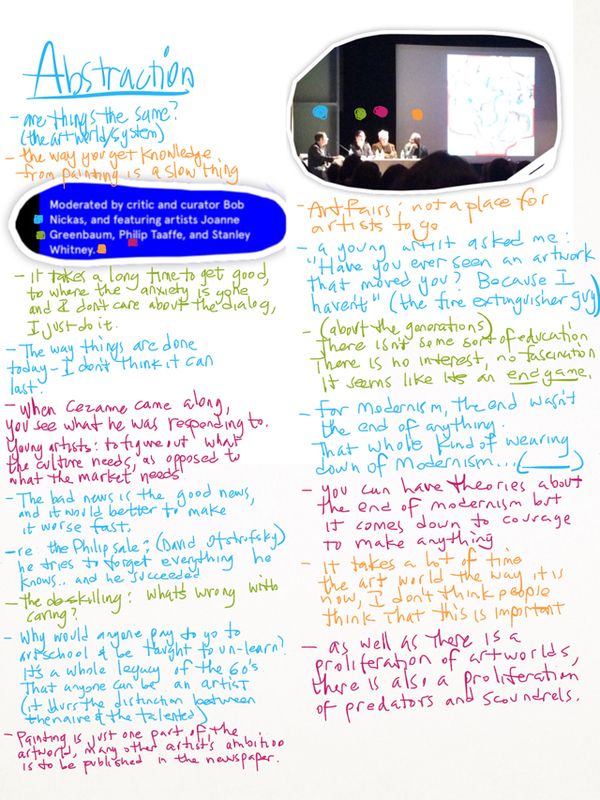 These are notes from last Thursday night's talk at the Jewish Museum, What's at Stake for Abstract Painting Today - and Where Do We Go from Here?, moderated by critic and curator Bob Nickas promised to be interesting, drawn in not only by the participation of friends Joanne Greenbaum and Stanley Whitney but principally by the title. I earnestly wanted to hear their thoughts about such a difficult subject as this, the future of abstract painting. How would Nickas frame it? Would they attempt an elementary definition of abstraction to clear the deck, and could they map out the territories of abstraction and define which aspects are well mapped, which are over-mapped and where is yet the terra incognito of abstraction? 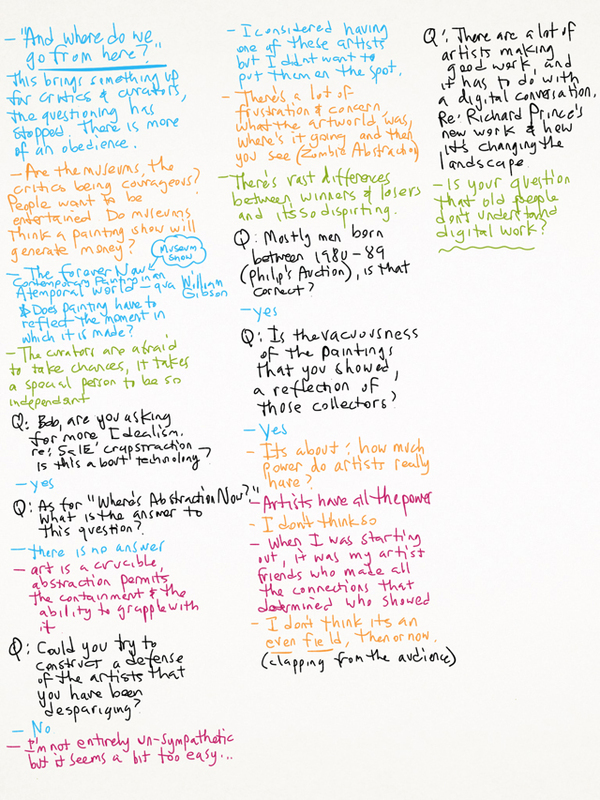 Instead, Nickas steered the conversation towards a one sided critique of current events now dominating the headlines via the recent auctions, the most notable being the Philips Under the Influence, where extremely young artists' careers have been supercharged by rabid speculation, instilling fears of a developing financial bubble in the art world, not to mention a distorting influence on art history. Indeed, this topic has been on everyone's mind recently, and no doubt a debate about it would be a welcome event. But that night's panel discussion needed the presence of some of these younger artists in question, not to mention some of the collectors and dealers who are involved in the dynamic. Have you heard of the Ideological Turing Test? It's call to empathy towards one's intellectual opponent. Such a precaution requires us to first state your interlocutor's position as good or even better or more vividly than they can, before you start to dismantle it. It would have been good to have heard from the devil's advocate that night. The artists who comprised that night's panel did their best to temper the arc of the discussion. At one point, Nickas brought up the prospect of a museum exhibition set to open in the near future and asked their opinion about it. The artists on the dais all responded as politely as they could, saying variations along the line: "...when I see it, I'll tell you what I think". As for the question of what's at stake for art today, the artists Greenbaum, Taaffe and Whitney all offered wisdom despite the difficult terrain charted by the moderator. "Where do we go from here?" indeed.